Certain South American countries are known for their breads made with cheese, eggs, and manioc flour (also known as yuca flour, cassava flour, or tapioca starch). In Brazil, there's the famous pão de quiejo. Colombians have pandebono and almojabanas. Paraguayans enjoy a similar bread called chipa. The ingredients for these cheese bread recipes are very specific, and the wrong substitution can greatly alter the recipe. Fortunately, you can find all of the ingredients online if they're not available in your area. The unifying ingredient in these breads (except for almojabanas) is the yuca (cassava, tapioca) starch, which gives them their special texture (and makes them gluten-free). I've found that the tapioca flour I can buy at health food stores in the US is very fairly sour because it has been fermented. Some of that sour flavor is good in these recipes, but too much can be overwhelming. I like to use half sour cassava starch, and half sweet ("dulce" or " doce," which is unfermented). You can find the sweet cassava flour online here. Or you can make things very simple and just order the pão de queijo mix! Chipa and pandebono have both tapioca flour and corn meal (pão de queijo does not typically have corn meal). Chipa are made with a very finely ground cornmeal. Processing US style corn meal for a few seconds in a food processor works well as a substitute. The corn meal used in Colombian pandebono is called masarepa, which is a precooked corn meal normally used to make arepas. It's fairly easy to find masarepa in Latin markets or even in the Latin food section of your supermarket. The cheese is another specialty ingredient. All three of these breads are made with a local salted version of fresh cows milk cheese, similar to queso fresco. 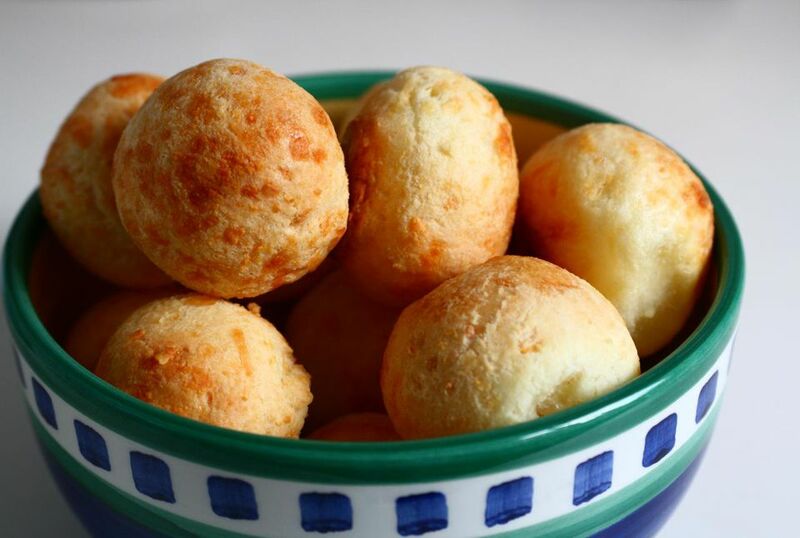 In Brazil, pão de queijo is made with queijo minas cheese, from the Minas Gerais region. Substituting half feta and half farmer's cheeseworks well in all three of these recipes. Be sure to taste the dough for salt - some farmer's cheeses are saltier than others. Although these breads seem similar to the US palate and have some common ingredients, each is made in a very specific way in its home country. But that first bite of warm cheesy pao de queijo, pandebono, or chipa will make the work of tracking down the special ingredients worth all the trouble.